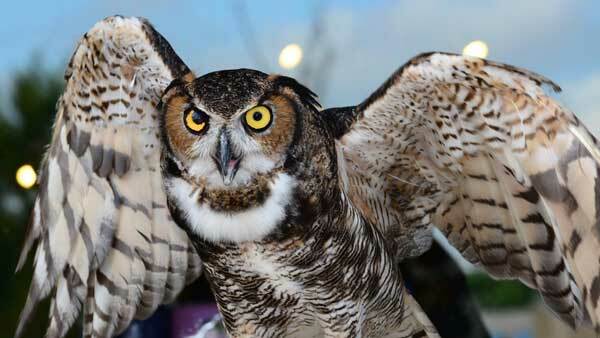 A suburban man is facing federal prosecution for allegedly violating the Migratory Bird Treaty Act by having feathers of a great horned owl and several other birds. Despite an alleged threat of witchcraft "against all those who wish him ill," the feds are prosecuting a suburban man they say illegally sold vases and masks containing the feathers of migratory birds, the Chicago Sun-Times is reporting. A shrine "consisting of an elephant foot surrounded by 30-plus animal skulls and skeletons" was allegedly discovered in Carlos Lopez's basement in unincorporated Glen Ellyn five years ago as law enforcement began investigating complaints of animal parts disposed of outside his home, federal court records show. Lopez now lives in Bensenville. But now prosecutors have charged Lopez, an apparent practitioner of the Afro-Caribbean religion Santeria, with violating the Migratory Bird Treaty Act and other laws when he sold the feathers of a barred owl and red-tailed hawk. He also was caught with the feathers of a cedar waxwing and great horned owl, according to an information filed in the misdemeanor case against him. Federal agents have been investigating Lopez for years, making undercover visits to his booth, labeled Botanica La Fe, at the 5 Star Indoor Swap Mart in Villa Park. Lopez allegedly agreed to sell items made of goat horns and lamb scrotums-both containing feathers-to federal agents, along with a bag of lemongrass in 2012. Even though he agreed to sell for $46, he took only $40.05. He once allegedly explained that "he finds a lot of birds that have been hit by vehicles and that he collects feathers from the dead birds." Years later, he allegedly arrived at the booth with a cardboard box, and a federal agent "saw something move." Lopez then allegedly explained it was filled with doves, chickens, quail, pigeons and a rooster. Lopez allegedly said that in his religion, as a priest, he can kill roosters and goats. The information charging Lopez points to visits by an undercover officer to Botanica La Fe in summer 2014. Worker Maria Elizabeth Paredes-Macias, also identified as Lopez's girlfriend, allegedly offered to sell some of the merchandise to an officer in June and July of that year, once remarking that the items should cost more because Lopez "was at risk of going to jail." The pair pleaded not guilty Wednesday in front of U.S. Magistrate Judge Michael Mason. Attorneys for the two defendants declined to comment. The feds filed the case against Lopez and Paredes-Macias in late December, but sought to seal it until the pair's arrest, fearing they might flee. They wrote in a court filing that Lopez "became extremely agitated" when a search warrant was executed, calling it "disrespectful to him and his religion." Both have now been arrested and are free on bond. Prosecutors said Lopez was believed to have sharp knives "used in animal sacrifices," and said "he was going to perform witchcraft against all those who wish him ill." Paredes-Macias "is believed to be a Mexican national" but shares a Social Security number with other individuals with different names, according to court documents.